And no, we're not talking NiGHTS or Panzer Dragoon Saga. On January 25, 1996 , classic game developer Treasure released Guardian Heroes onto the Earth, a game that would eventually go down in history as one of the studio's most timeless masterpieces. And when a game is put in the same category as treasures such as Ikaruga, Radiant Silvergun, and the one and only Gunstar Heroes, you must be doing something right. 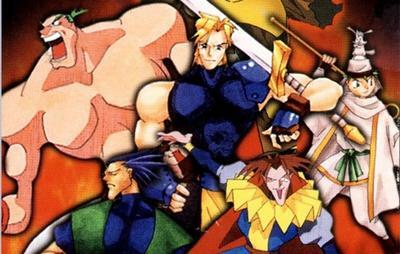 Guardian Heroes is a classic 2D beat 'em up, loaded with high octane combos and plenty of knock-your-socks-off moments. However, unlike more traditionally isometric games from the genre, Treasure's spin on things plays across a straight plane, more like a Street Fighter game than anything else. And not just one plane, but three. Any character you choose will spread his abilities across three separate fields of gameplay, with the ability to jump between them at will depending on where the action is taking place. And this game throws a lot at characters, too. Brief bouts don't take too long to bring to a close, but our protagonists will be fighting an astounding number of enemies in that time frame, more often than not to within an inch of their own lives. The SEGA Saturn also handles this game's 2D sprites and massive number of effects as well, generally sticking to an acceptable framerate and not chugging down to slideshow speeds. While rather standard nowadays, Guardian Heroes was also one of the first games to incorporate levels and RPG elements into the genre. Each character has a set of abilities that can be boosted or stats that can increase as the player sees fit. Naturally, if you are playing as Randy the mage, you're going to want to pump those points into magic. On the flip side, melee fighters like Samuel need all the attack stats they can get. Again, such genre busting ideas were revolutionary at the time, and it now stands as an iconic monument to show how RPGs could affect even the action games of today. And then there are the branching level choices. Guardian Heroes is one of the most replayable action games ever created because the heroes can trot down countless paths to one of dozens of endings. Do you rescue villagers from a fire or pursue the arsonist? Pursue an army through a dark forest or creepy graveyard? The end of every level branches into two or three other levels based on the player's decisions, expanding further and further into a web of possibilities. Each of these paths introduce new faces, new scenarios, new vantage points on the events and looks into the hearts of your enemies. The game also keeps track of these too with a registry of characters beaten through each playthrough, further satisfying the primal needs of RPG completionists. Let's not forget that the cast is excellent, vibrantly animated and brimming with personality. Each of our heroes stems from prototypical characters of the pre-anime boom days, back in the 90s when anime wasn't created solely to please its niche audience. Funny quirks, oddball humor, a perfect blend between serious and carefree, never once brooding or sad. You'll want to get to know these characters in depth as any cast of a traditional JRPG, and the game's endless possibilities will open up their souls for you to explore. Sounds great, huh? So where do you sign up? Now the hard part. Guardian Heroes was released for a limited run on a poorly selling platform. Sorry, Saturn fans, but it's true. The original game will cost you somewhere in the ballpark of $80, not to mention a Saturn if you don't have one. Mine's been pawned off, sadly. The easier way to play this game is on the Xbox 360. SEGA and Treasure put out a drop-dead gorgeous HD remaster of the game back in 2011, cleaning up the sprite work, adding widescreen support, retooling the multiplayer functions, and fixing button layout problems that the Saturn's limited design caused. Combat feels better, characters can air-dash, and an astounding 12 players can play at once, an improvement over the previous possibility of six. Never one to shun history either, Treasure also included the original Saturn version as a bonus in this package as well. The problem is that this Xbox 360 version is only available for the Xbox 360. Microsoft hasn't tapped it yet for backwards compatibility on the Xbox One, and for whatever reason, SEGA and Treasure haven't put it up on Steam yet. I have no idea what the hold-up is, there. I can't think of a better time for Treasure to further tap into its legacy, and Guardian Heroes is a perfect fit for the direction Steam is heading. This game is 20 years old, and it needs to be played before fate further blasts it into obscurity. Check it out any way you can. It's one of those marvelous games that feels just as good now as it did when it was first released. And just for the curious, several of the developers for this game would go on to make Atlus' charming beat 'em up, Code of Princess on the Nintendo 3DS. The influence is unmistakable, and it stands as a worthy spiritual-successor all the way down to the combat and charming characters. Much much better than the official Game Boy Advance sequel.